Seven Dead In Shooting At Sikh Temple In Wisconsin : The Two-Way The attack at a temple in a Milwaukee suburb is being investigated as a "domestic terrorist-type incident," police say. 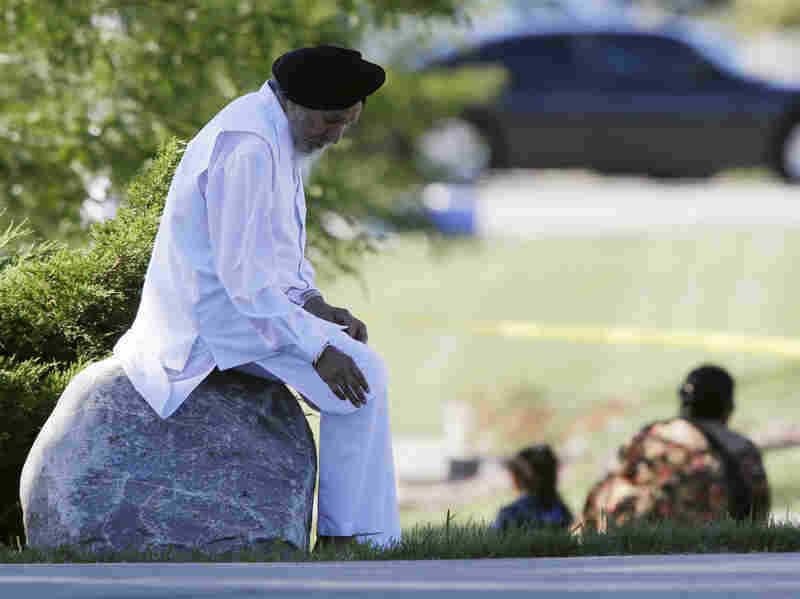 A woman waits outside the Sikh Temple of Wisconsin in Oak Creek, Wis, where a gunman opened fire and killed six people. The gunman was killed by police. Police personnel drive around the temple after the shooting. Bystanders wait outside the scene of the shooting. A police k-9 unit, left, and a robot, center, are outside the Sikh Temple. A man sits on a rock as police investigate. A shooting at a Sikh Temple in a suburb of Milwaukee today has left at least seven people dead, including the gunman, police say. The crime is being treated as a "domestic terrorist-type incident," authorities say. According to authorities, 911 calls about a gunman at the place of worship started coming in around 11:25 a.m. ET. One of the first police officers on the scene, officials say, was ambushed an armed man in the parking lot. Another officer exchanged fire with the gunman, who was killed. The officer who was ambushed was seriously wounded. Later, officers reported finding four people dead inside the temple and another three — including the gunman — outside. Details are still developing about just what has happened in Oak Creek, Wis. It's the second mass shooting in slightly more than two weeks. 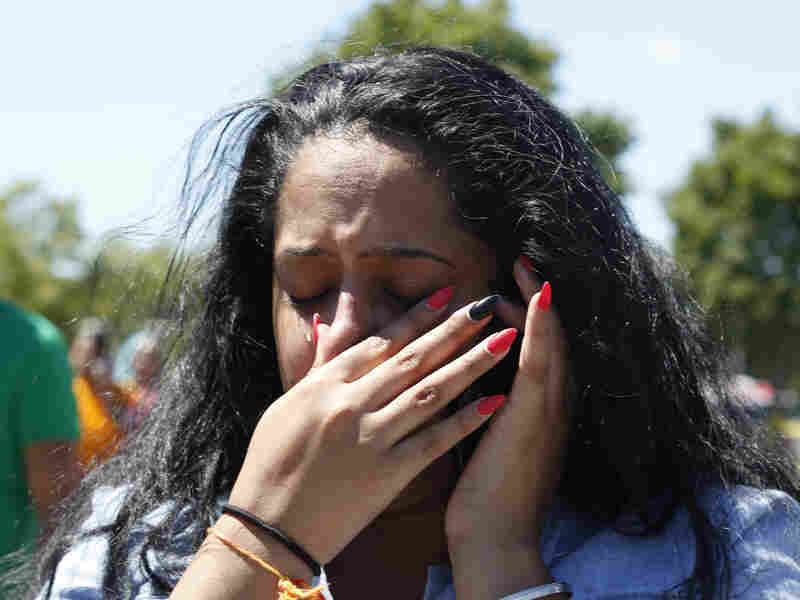 On July 20, a gunman opened fire on an audience at a movie theater in Aurora, Colo., killing 12 people and wounding 58. Some of the more solid reporting on today's shooting is coming from Milwaukee's Journal Sentinel. We'll monitor and update as information becomes clearer. "Shortly after 5 p.m., neighbors said a team of law enforcement officers, including from the Milwaukee County Sheriff's Department and the U.S. Bureau of Alcohol, Tobacco and Firearms, had entered a home in Cudahy. Authorities have blocked off several streets surrounding the house. "It was unclear whose home it is and how the search may be related to the shooting itself." Oak Creek Police Chief John Edwards just told reporters that "we're treating this as a domestic terrorist type incident" and that the FBI will be taking the lead in the criminal investigation. He also gave new details about the encounter between the suspect and police. Initially, authorities said that the same officer who was shot had exchanged fire with the gunman and "put him down." Edwards, however, said the gunman "ambushed" an officer and wounded him. It was a second officer who shot the gunman, Edwards said. According to Edwards, there were seven fatalities (presumably including the gunman) and three other people injured. Update at 4:40 p.m. ET. Obamas and Romneys Say The Victims Are "In Our Thoughts And Prayers." "Michelle and I were deeply saddened to learn of the shooting that tragically took so many lives in Wisconsin. At this difficult time, the people of Oak Creek must know that the American people have them in our thoughts and prayers, and our hearts go out to the families and friends of those who were killed and wounded. My administration will provide whatever support is necessary to the officials who are responding to this tragic shooting and moving forward with an investigation. As we mourn this loss which took place at a house of worship, we are reminded how much our country has been enriched by Sikhs, who are a part of our broader American family." "Ann and I extend our thoughts and prayers to the victims of today's shooting in Wisconsin. This was a senseless act of violence and a tragedy that should never befall any house of worship. 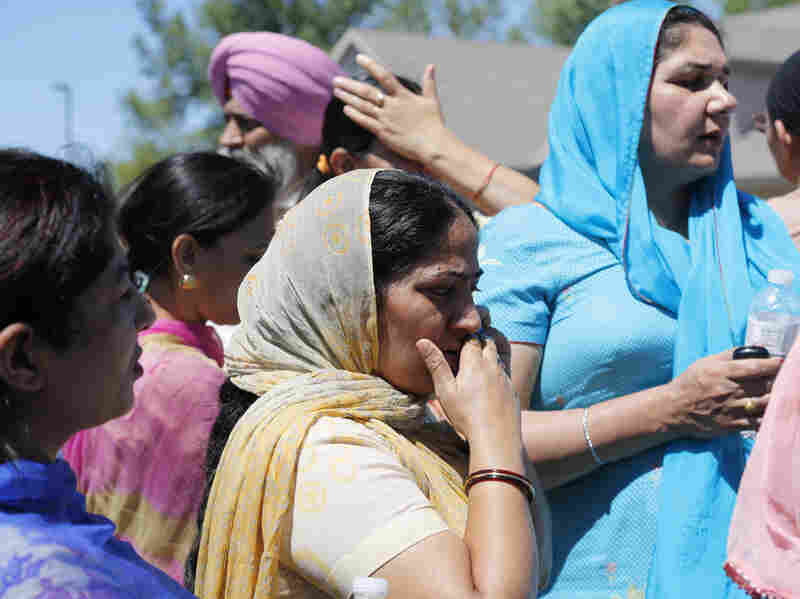 Our hearts are with the victims, their families, and the entire Oak Creek Sikh community. We join Americans everywhere in mourning those who lost their lives and in prayer for healing in the difficult days ahead." Update at 4 p.m. ET. More About The Sikh Religion. "There are an estimated 250,000 to 500,000 Sikhs in the United States. The Sikh faith includes belief in only one God and that the soul goes through cycles of rebirth and death before reaching human form. The goal of life is to lead an exemplary existence." Update at 3:15 p.m. ET. About The Sikh Religion. "More than 20 million people worldwide follow the Sikh religion, established about 500 years ago in the Punjab region of India. Devout male followers must wear long beards and their hair in a turban, and in America are sometimes mistaken for Muslims; the two religions are not affiliated. Sikhism is an offshoot of Hinduism, but unlike Hindus, who believe in multiple deities, Sikhs are monotheistic." Officers who have searched the temple say at least four people have been found dead inside and that there are three bodies outside the temple — including that of the gunman who was "put down" by the first officer on the scene — Greenfield, Wis., Police Chief Bradley Wentlandt just told reporters. He's acting as a spokesman for the agencies involved in the investigation. Wentlandt also said it is not known for sure at this time whether another gunman might have been involved. Though there were multiple reports of more than one gunman being seen at the temple, those might have been different people seeing the same person, he said. Three men now at Froedtert Trauma Center in Milwaukee are in critical condition with gunshot wounds, the hospital's chief medical officer — Lee Biblo — just told CNN. 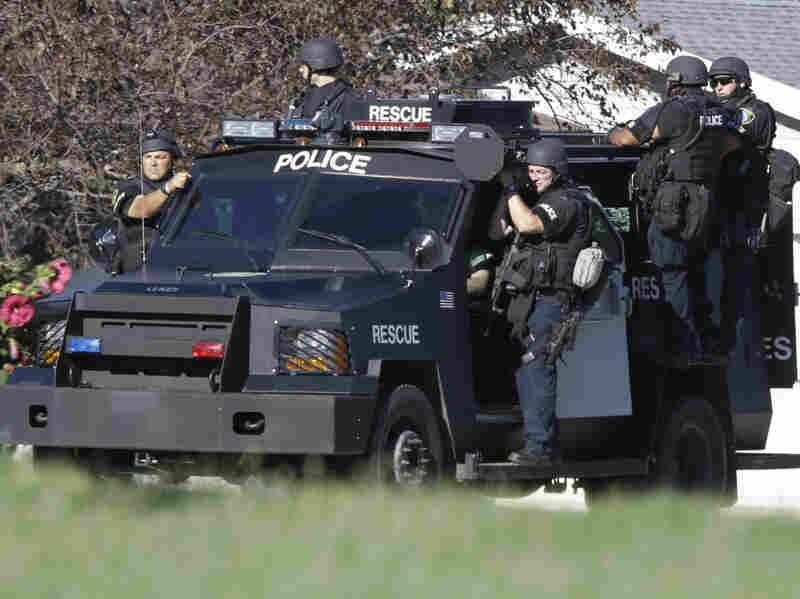 "SWAT team members were still sweeping the building about 1 p.m. [2 p.m ET] and a gunshot or explosion was heard from the building at that time," the Journal Sentinel says. It adds that "among those who were shot was the president of the temple, Satwant Kaleka, who was taken to a hospital. Deepinder Dhaliwal said Kaleka, his brother in law, was shot in the back, but has now been taken to a hospital in St. Francis." On CNN moments ago, a police spokesman told reporters that one suspect "is down." He was shot by a police officer who responded to a 911 call about a gunman at the temple. That officer was "shot multiple times," but is expected to survive. Authorities are now trying to determine if there might be another gunman or gunmen inside the temple. Milwaukee's WISN-TV has started streaming its coverage here. Update at 1:45 p.m. ET. Four Shot, Not Killed? As often happens in breaking news situations, what's being reported is changing from minute to minute. WTMJ, which earlier said that images taken from a helicopter showed at least four people who had been killed, now says the pictures "showed at least four people who were shot." The Journal Sentinel is saying "at least four people were shot just after 10 a.m. Sunday." RadioReference.com has put one channel of the Milwaukee County Fire Department's radio traffic online here. Milwaukee's WTMJ Newsradio says pictures taken from news helicopters show "at least four people who were killed." Authorities, though, have not said anything about any victims. WISN-TV from Milwaukee is reporting that police suspect a gunman may still be inside the temple and that there may be hostages. A spokeswoman for the Froedtert Trauma Center in Milwaukee just told CNN that two with gunshot injuries have been brought to that facility.